In many respects a budget isn’t just a piece of paper, it’s more like a living, breathing organism. It changes, grows, flexes, and contracts, in many cases based simply on the stage of life. When you’re living on your own, cooking can be a pain. Most recipes start at two people, single portions of meat are ridiculously expensive, pre-packaged meals for individuals may not be too healthy (think Top Ramen), and it can really just seem like a lot of work to cook for yourself, sit down to dinner, and clean up pots and pans just for you. Budget: Factor in times that you want to cook for more than just yourself. Having friends and family over makes your home feel warmer. Also, don’t eliminate buying in bulk as a cost-saving measure. You can use a Foodsaver or freezer bags to reduce your cost on high-ticket items like meat and fish. Top Tip: Make your own pre-packaged meals. The best thing I did when I moved into my first apartment by myself is I broke out the Foodsaver. I could either cook several meals and freeze them in single-size portions, or when I would go grocery shopping, I would divide the ingredients in single-serving portions. When you make your own “microwave meals,” you know what you’re eating nutritionally, and it’s far cheaper than buying actual pre-packaged meals. Being part of a couple is a food process. You walk into it with different tastes, different food priorities. For example, my husband and I love food. We’re both foodies, love going out to restaurants, and would rather have a higher food budget than an entertainment budget. We also both work and sometimes do not have any energy to cook, or in my case, remember to pull the chicken out of the freezer two hours prior. Budget: Take a look at the food budgets you had, and how you ate, prior to the relationship and merge that together. If one of you only ate in, and one of you only ate fast food on the go, talking about your food budget is a good way to talk about how your life will be together. Top Tip: Factor in your restaurant spending. If you know you go out to restaurants at least once a week, but your food budget only covers grocery shopping, there’s going to be a giant, expensive hole in your budget. Having a family can put a financial strain on any budget. It’s not meant to be harsh, I think that families are a great and wonderful thing and I come from a large family. I watched my family go grocery shopping only after cutting out all coupons and coordinating them with store sales. Budget: The good news is you can now take advantage of all those bulk deals you always saw. $0.99/Lb? Only if you buy 10 pounds? No problem! The bad news is the cost savings on buying in bulk doesn’t necessarily offset the cost of feeding more people. You can mitigate the damage by keeping track of store sales, stocking up on non-perishable items, and cooking only one meal at a time. Picky eaters will eat when they’re hungry enough. Lastly, don’t buy food just because it’s on sale. A pantry full of great deals that no one will eat is still a waste of money. Top Tip: Don’t be afraid of specialty diets or allergy issues. The more people that enter a food budget, the more likely you are to encounter allergies, intolerances, health issues, and special diet programs. This doesn’t have to capsize your budget. Just remember to check the labels of what you purchase so you don’t buy something you can’t use. Also, look for specialty markets that will offer better prices on the items you need. At this point in society, retirement means many different things to different people. My grandfather was scuba diving well into his 70s, whereas my grandmother will never completely retire. Oftentimes what defines retirement is the shift from an employment/business-based income, to a fixed investment based income. However, there’s a lot of increased available time for different experiences, and different tastes. Budget: A fixed budget can make things both easier and harder. If you know exactly what you have to spend, it doesn’t leave a lot of room for confusion, and you can develop a routine that keeps your budget in check. However, it also doesn’t necessarily leave room for a lot of escapades, and may not increase with inflation. It’s important to be aware of your budget, but not wary of it, and make good decisions. Top Tip: Pool your resources. Between friends, family, and community groups, there are considerable opportunities to have great experiences without adjusting your budget. Whereas hiring a private chef to teach you Thai cooking may seem frivolous, getting together with many of your friends can make it an affordable event. Take advantage of any discounts available to your age bracket. My mother was a little depressed when she turned 55, until I reminded her she qualified for senior discounts. She can save so much money that I’m ready to bypass my 40s and head straight there myself! Thinking of a budget as a living, breathing thing that changes it’s form when you change your life can be an excellent visual tool. When you have more, your budget has more, whether that be time, money, or people. When you have less, your budget contracts. Openly examining your life and circumstances will help your budget to be a friendly tool instead of an adversary. Andi Blackwell has spent over a decade writing about personal finance, local features, and health & wellness. A happy locavore residing in Portland, Oregon, she spends most of her time writing about eating seasonally with healthy meal plans at Meal Plan Rescue, and exploring the city with her husband when he can peel her away from her laptop. Love how you broke this down into the situational categories. We’ve definitely seen our food budget evolve – our youngest just turned a year old, and we’re seeing the importance of buying a lot of fruit and vegetables, which cost more money than junk. But it’s necessarily to give my kids the healthy foods they need! Congratulations on your little one! Fruit and vegetables are definitely important, so I would try buying seasonal produce. I base all our meal plans on what’s in season and according to a farmer I know, eating in season can save you 66% on your produce! I definitely agree with the single stage — although I don’t know what Foodsaver is, I do portion out meals into freezer safe containers and make something big and freeze when I think I’m going to get sick of it! A Foodsaver is a device that vacuum seals your meals into individual packages. It’s excellent at keeping your food from getting freezer burn and taking advantage of loss leaders. 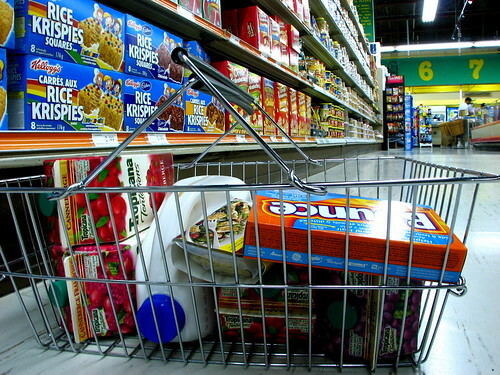 Depending on your priorities and preferences, you may have a small or large budget for food. The key is making changes elsewhere to accommodate a larger budget for food. It is a balance of spending that works. That’s most definitely true, but oftentimes people spend more than they need to because they purchase without a plan. Even I succumb to munchies and cravings, but by keeping my situation in mind, eating seasonally and watching sales fliers, I don’t have to spend full price on many groceries. I really should start making some frozen single serve portions for all of those nights I get home from work and the last thing I want to do it cook. Right now I just normally break open a can of soup or something similar and that gets old after a while. Glad one of my tips helped you! And you can’t be having soup in the summertime! Smart leftover utilization can help you too. For example, if you have chicken tonight, make an extra piece, slice it and put it in the refrigerator. Have some salad mix or some leftover vegetables in your fridge/freezer and toss them into a tasty meal tomorrow. All you have to do is add your chicken and eat! Good tips! I like the concept of a flexible budget on a monthly basis also. Some expenses stay the same every month, but others can vary. When the budget stretches in one area it needs to contract in another. The trick is to be sure it doesn’t stretch in too many places! Whenever we cook, we make extra to put in the freezer for quick meals later. It’s easy & comes in handy. I especially like to do this with meats. I can easily add some frozen vegetables to make more of a complete meal. It beats getting fast food! I try to set a goal budget for our food. I don’t like to pay more than a set amount per pound for meat, and if I find some extra good deals, I can splurge a bit in my other grocery categories. Glad you’re beating fast food! Great tips! We usually try to make extra and freeze single servings to use for quick meals during our busy week. Awesome tips! It’s especially important to remember that even though you are a single person doesn’t mean you can’t save by buying in bulk. Consider splitting the bill with a couple of other single friends, or, if it can be saved for later, freeze it like you suggested. Great money-saving tips! Thank you. I should also add that if you join a bulk-buying club like Costco, you can always split the membership fee and GIANT packages with a friend. Good post. We try to use leftovers as lunch for the week. I really enjoy taking my lunch to work instead of paying to go out. It saves money and I don’t tire of eating out so fast. I think my problem is I never tire of eating out! 😉 But I’m glad you’ve found a system that works well for you. We just started to experiment with cooking again. My wife made 2 meals in 1 week. It’s been nearly 3 years since I have had my wife’s cooking. Thanks to the 2 little ones. Cooking is amazing, but can be a bit of a pain when you haven’t done it in a while. You have to get a mantra going, like shout “Viva la kitchen!” when it’s time. Next post: Will You Be Debt Free or Wealthy?